*NEW: There is now digital access so that you can assign the pages on Google Classroom! Observe It: This section includes the picture with plenty of white space around it. The white space is for students to make literal AND inferential observations. Take as many notes as you can, encourage students to stretch their thinking, and watch their inference skills grow with EVERY picture you observe! Examples of observations are included. Answer It: This section has a task to complete that focuses on the reading skill AND relates to the picture in the “observe it” section. Apply It: This section has a short story that loosely relates to the same topic shown in the picture (but does NOT represent the picture) and includes a task that relates to the reading skill focus. The images print well in black and white. I do encourage you to project or show a color image for students so that they can make even more observations. I have included an answer key, but PLEASE NOTE: students should be encouraged to come up with their own original answers. Since many of the tasks are open ended, there are many, many justifiable answers. These tasks are meant to encourage kids to think outside the box! You will be amazed at what they come up with. Also includes a cover page to make this into a practice booklet, additional resource links to my SEVEN blog posts about using pictures to teach reading skills, and observation samples. I strongly suggest working through several of these pages as a whole group before allowing students to work independently on them-- particularly the "OBSERVE" section. These printables are perfect for whole group or small group instruction, morning work, literacy centers, and more! Do you love teaching reading skills? 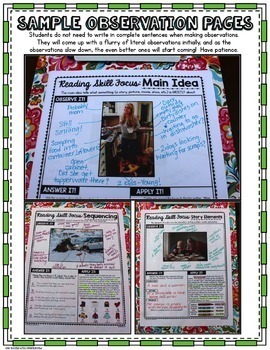 Check out my Reading Skill of the Day Review Journal! 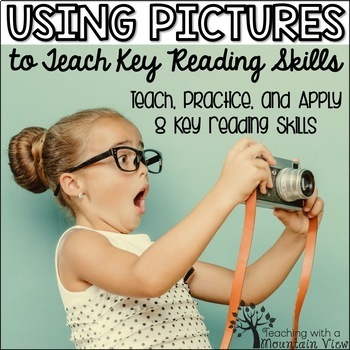 I LOVE to incorporate pictures into my reading skill instruction! 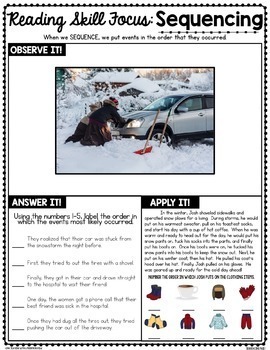 See MORE Picture Task Cards HERE!